What is a Hero or Heroine? How does one arrive at this exalted position? According to “Big Brain,” my talking “Franklin Language Master,” the attributes are the same for both sexes. Heroes are individuals admired for their achievements and qualities. They especially demonstrate the courage to conquer fear or despair. Where are the Heroes of today, when the world needs them so desperately? Are we the audience and the major news media equally responsible for the lack of publicity for Heroes? Have you ever wondered, “Why is there such a focus on traumatic, violent and frightening events?” Does a steady diet of this material perpetuate fear and despair? Do we experience a vicarious thrill from the misfortune of others? Are our senses dulled, ethics corrupted and morals so jaded we require greater quantities of violence and shocking events to stimulate our interest? I still remember when one murder caused social outrage and community activism! Too many people today are apprehensive, frightened by things beyond the edges of perception. They are afraid of many things. Riots, wars, terrorist acts and natural catastrophes are increasing in frequency and intensity. Physical and emotional abuse, chronic diseases, financial failure affect every family to different degrees. The consequences of unremitting fear just don’t go away by themselves. The quality of life decreases dramatically when all hope is lost. Something positive must be done. A solution is to locate and publicize real-life Heroes in these fearful and perilous times. The tremendous need for inspiration and positive role models increases exponentially with each horrific act and devastating event. Experts believe a factor of ten times as much positive stimulus is required to overcome one negative event. How many people are desirous of reading and seeing uplifting articles about people triumphing over human trials, tribulations and misery? Are there any real-life Heroes laboring to help solve the immense social and environmental problems facing humanity? I believe the answer is an emphatic yes! Heroes are everywhere! They are ordinary people determined to serve and help others; to make the world a better place. Daily, across the face of the earth, people willingly assist family members, friends, and strangers. They compassionately minister to the injured, poor and sick. They Help Enthusiastically, Responsibly, Optimistically, Exceptionally and Socially (HEROES), with no fanfare, demand for recognition or public acclaim. These humble people of every race demonstrate the loftiest qualities of humanity. All societies need Heroes to rise up and be recognized. The light of their actions should be publicized by local television and print media. These extraordinary, ordinary people are an inspiration to others. They are a catalyst for beneficial change in their communities. The time has come that people must concentrate on the good in each person, rather than the evil that plagues our world. Children and teenagers desperately need to learn about those who reach out and beneficially touch the lives of others and those less fortunate. Victor Hugo once shared, “There is one thing stronger than all the armies in the world, and that is an idea whose time has come.” A group of individuals concerned about the minimal amount of media coverage for real-life Heroes are creating a “In Search Of Heroes Program” for teenagers. 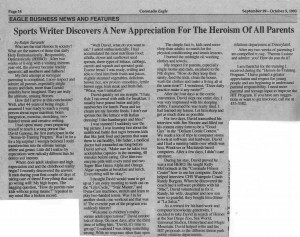 Ralph Zuranski, former Special Features writer for the “Coronado Eagle Newspaper,” is looking for promising young writers and journalism mentors for them to go out into their communities in search of local Heroes. Just as “Superman” was accompanied by “Jimmy Olsen,” these cub reporters will help locate the Heroes, conduct the interview and contribute their thoughts and impressions. The finished product will then be submitted to newspapers, magazines, television stations and published on the In-Search-Of-Heroes website that is in the final developmental stages. 1. Identify and praise local Heroes. 2. Educate people about Heroes and heroic action. 3. Inspire young people to want to become Heroes. 4. Help young writers and photographers develop and perfect their writing skills. 5. Receive published credit for their writing, art and photo contributions. Extensive research has proven individuals often meet or exceed their own and other’s expectations. When children envision themselves as Heroes, heroic action is not far behind. Public recognition and concrete rewards for excellence are a wonderful incentive for young people. Every person can benefit by creating a Hero or Heroine within, to help them deal with the difficulties of life. Eleanor Roosevelt once said, “The future belongs to those who believe in the beauty of their dreams.” The creators of the “In Search Of Heroes Program” have the desire to inspire young children to dream, to imagine themselves Heroes. These people are working hard to create vehicles for the dreams of teenagers to become reality. As in the book “Dune,” the dreamers must awaken. People need to believe they can make their dreams for global peace, joy, prosperity and love a universal experience. The heroic example of others is a prerequisite. 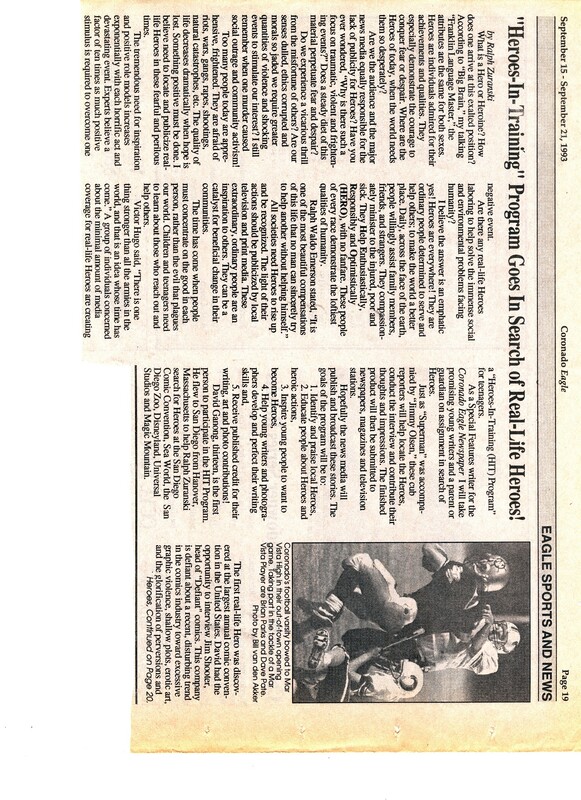 The Second “In Search Of Heroes” Article Published in the Coronado Eagle Newspaper in 1993: Parents Are Heroes! Who are the real Heroes in society? What are the names of those that daily Help Enthusiastically, Responsibly, Optimistically (HERO)? After two weeks of living with a visiting thirteen year-old, the answer became readily apparent; all mothers and fathers! My first attempt at surrogate parenting is completed. I now respect and admire all parents, especially single moms and dads, more than ever. They are truly the ultimate, unsung, and unnoticed Heroes. How did I arrive at this conclusion, this realization of fact? Well, after 44 years of being single, I assumed I was ready to teach a young person about super nutrition, brain integration, exercise, stretching, two-handed tennis and creative writing. I had spent many years preparing myself to teach a young person like David Ganong, the first Hero-In-Training, the most valuable things I had learned in 30 years of health research. Boy, was I in for a big surprise! I erroneously believed I could transform him into the ultimate teenage athlete and genius. Little did I realize my expectations were radically different than his desires and interests. Where does adult idealism and high expectations end and the childhood reality begin? I recently discovered the answer. It ends during your first couple of days! Everything that can go wrong will! My high hopes, great expectations and idealism diminished quickly. I began to wonder how parents raise kids without going insane. I immediately checked with the agent. She searched for his name on all flights out of Boston. There was no listing. I wondered, “Am I getting old and senile or are his parents playing tricks?” I was looking for someone to blame. Had I transcribed the wrong information or did they mistakenly give me incorrect data? Was this a test of my intestinal fortitude and ingenuity? I began to feel the stress building, the anxiety increasing. I thought sarcastically, “Fine, thanks a lot kid. You really know how to score points with someone, concerned about getting older.” I began to get upset but suddenly realized his statement was only childhood honesty. I was getting older, just as he was becoming a young man. We started off on the wrong foot. Someone had blown the flight information, but everything worked out. He confessed being quite frightened after 90 minutes of searching for a familiar face. I was very relieved he had recognized mine, no matter how I had aged. One thing that really surprised me was how much children sleep. David worked overtime at the San Diego Comic Convention. He interviewed Jim Shooter, one of the most important people in the comic industry and head of “Defiant Comics” We were up until 11 PM every night and had to get up early. I thought David would want to get up at 5 AM every morning to work out on the “Life Cycle,” “Stair Master,” and Dyna-Cam machines, stretch and learn to play two-handed tennis. Was I in for another shock; one workout and that was it! The exercise part of the program was suddenly history! “Welcome to child reality versus adult expectations!” David needed lots of sleep. On most days, after the third time of telling him, “David, it’s time to get up,” I realized I was doing something wrong. With no response other than open glazed eyes, it occurred to me to ask, “Are you listening to me?” The blank stare was enough. It dawned on me he was sleeping with his eyes open. I wondered, “How do kids do this? Is he deliberately trying to torment me?” I soon discovered the answer was no. The simple fact is, kids need more sleep than adults; so much for the physical conditioning and tennis lessons. Another question I asked often is, “Why do kids need a new towel every time they take a shower? After all, their bodies are clean when they come out of the shower, aren’t they?” Theoretically, one towel should last at least a couple of weeks. After the four days at the comic convention, David slept one entire day. I was very impressed with his sleeping ability. I assumed he was really tired. I had learned my lesson. Let him sleep and get as much done as possible. For two days, David transcribed his interview with Jim Shooter and filled out his contest entry form to be a “Good Guy” in the “Defiant Comic Contest “. David was very interested in winning the $1000 and royalty contract so he could buy a new CD-ROM drive for his MacIntosh computer. We made a lot of trips to computer stores to look at software and hardware. David and I had a running battle over which was best, Windows or MacIntosh based computers. After a few days, I didn’t really care anymore. As a reward for his hard work and computer knowledge generosity, I decided take David in search of Heroes at the San Diego Zoo, Sea World, Universal Studios, Disneyland and Magic Mountain. We worked together to make “Eagle” Press Credential Passes. David helped write and fax HIT proposals to the different theme park public relation departments. After going to the Zoo and Sea World I was sick of amusement park rides. We needed another teenager to accompany David. I called my best friends Cindy and Ted Neale. Their 15 year old daughter Laura was interested in participating in the HIT Program. I was thrilled and relieved. We traveled to Los Angles and stayed at the luxurious home of Bernie Kowalski, television producer of Magnum P.I., Air Wolf, Perry Mason, Knight Rider and Jake and the Fatman. Laura is his granddaughter and her parents were very gracious. The whirlwind tour was exhausting and humorous. I will have a special report on the perceptions of my two cub journalists, their ratings of the parks and rides and the funny situations that occurred. We all ate lots of junk food and ice cream. After my two weeks of parenting I am compelled to say, “Parents I salute and admire you! How do you do it? I thank God for Super Blue Green Algae that makes you smart, keeps you healthy and gives you energy, enzymes that digest pizza (which we ate continuously), and acidophilus that prevented constipation.” Both David, Laura and I survived in style, became the best of friends, and learned to respect each other. Both David, Laura and I learned that becoming HEROES is not as simple as we thought. 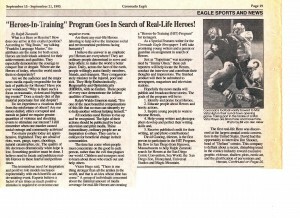 I am thankful for the training I received and realizations experienced during the Heroes-In-Training Program. I have gained a greater appreciation and respect for young people and am beginning to understand parental responsibility. 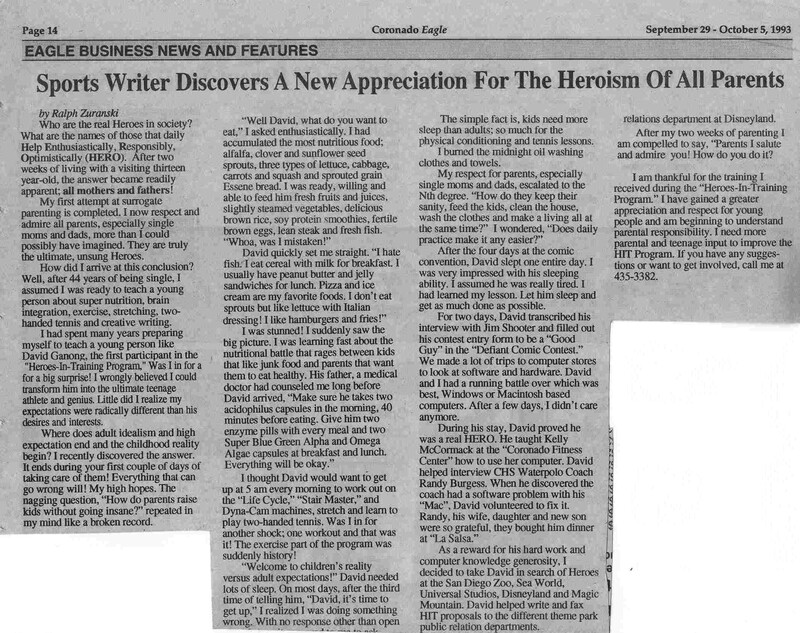 The Third “In Search Of Heroes” Article Published in the Coronado Eagle Newspaper in 1993: Laura Neal Comic Book Heroine! The sickening screech of tortured rubber against rough pavement startled early morning Los Angeles commuters and residents. The frightening sound was a forewarning of impending tragedy. In the blink of an eye, the thunderous explosion of sound caused by two autos colliding announced the beginning of the ultimate, unthinkable, nightmare chain of events for an innocent family. The hearts of witnesses ached at the terrible sight before them. Waves of anger and disbelief washed over the bystanders. People raced to aid of the seriously injured young girls. Strong arms imprisoned the drunk driver, as he attempted to run, blocking his escape. Laura and Sarah Neale were on their way to school. Now they lay trapped in the twisted wreckage of their parents car. Both were screaming in pain, grief and disbelief. The irresponsible young man who caused the accident was too drunk to care; too inconsiderate to comprehend the devastating consequences of his drinking and driving. The thoughtless actions of this drunk, uninsured driver, who was on probation, resulted in a tragedy of devastating proportions. 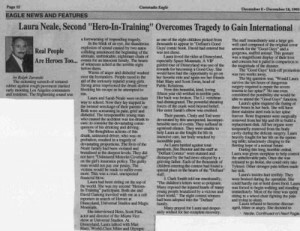 The lives of the Neale family had been violated and brutalized at the deepest levels. They did not have “Uninsured Motorist Coverage” on the girl’s insurance policy. The guilty man would not pay one penny. The victims would be made to suffer even more. This was a cruel, unexpected financial blow. Laura had been sitting on the top of the world. She was one of eight children chosen from thousands to appear in “Defiant’s Good Guys” comic book about the fictional lives of young super heroes. Now this beautiful, kind, loving fifteen year old writhed in terrible pain. Her back was broken. The L1 vertebrae had disintegrated. The powerful shearing forces of the crash were beyond belief. Her sister Sarah’s elbow was crushed. Their parents, Cindy and Ted were devastated by this unexpected, incomprehensible turn of events. They suffered in agonized silence. They were unable to help Laura as she fought an intense battle against total paralysis, her body wracked by incredible pain. As Laura lay immobilized in her hospital bed, Jim Shooter and the staff at “Defiant Comics” were stunned and dismayed by the bad news relayed by a grieving father. Each of the thousands of children entering the contest had found a special place in the hearts of the “Defiant” staff. The eight contest winners had been adopted into the “Defiant” family. Many prayed for Laura and desperately wished for her complete recovery. The staff immediately sent a large get-well card composed of the original cover artwork for the “Good Guys” and a gorgeous, stuffed animal. This gesture was a magnificent display of their love and concern but it paled in comparison to the magnitude of the disaster. The “Good Guys” kickoff promotion was only two weeks away. The big question was, “Would Laura survive the ten hours of dangerous surgery required to repair the severe trauma to her spine?” No one even considered the possibility she would be able to attend the function. Laura’s spine required the fusing of three bones in her back. She would have three stainless steel rods in her spine forever. Bone fragments were surgically removed from her hip and rib to build a replacement vertebrae. All her organs were temporarily removed from the body cavity during the delicate surgery. Laura bravely fought for her life on the operating table; tenaciously clinging to the fleeting hope of a normal future. During this long, horrible ordeal, Laura was given morphine to help control the unbelievable pain. Once she was released to go home, she could only take Tylenol. Other stronger pain killers made her sick. Laura’s insides hurt terribly. They were bruised during the operation. She could hardly eat or hold down food. Laura was forced to begin walking and standing immediately. Most of the time was spent sitting in a wheel chair fighting the pain and trying to sleep. Laura refused to become discouraged, bitter or angry. She decided to focus on good. Laura made up her mind that she would be there, on stage, when Jim Shooter introduced the eight “Good Guys” to the world. She knew that a lot of kids who read the “Good Guys” comic were expecting her character “Flex” to triumph over this tragic event. November 27, the big day, arrived in a blur. Laura proved she possesses a special, heroic level of courage and determination. She survived the 60 minute drive to “Mile High Mega Comic Store” and stood on stage with the other children long enough to be introduced as a Good Guy. Then she sat bravely in her wheel chair for over an hour signing autographs for the adoring fans. After working with and interviewing most of the “Defiant” staff over the last six months, I believe they are the moral leaders in the comic industry. They are dedicated, caring individuals producing quality stories. Their efforts to inspire young and old alike to live good, responsible lives are making the world a better place. The “Good Guys” comic book and the ongoing contest to find new Heroes is transforming the minds, hearts and spirits of young people. They single-handedly are creating a grass roots movement designed to inspire young people to become real-life Heroes in their homes, schools and communities. It is about time someone caused people of all ages to discover and implement the human qualities and actions that make Heroes out of ordinary people.